Democratic Sen. Tim Kaine of Virginia won re-election over a firebrand Republican supporter of President Donald Trump with strong backing from voters who say the country is headed in the wrong direction, a wide-ranging survey of the electorate shows. RICHMOND, Va. (AP) — Conservative provocateur Corey Stewart started his U.S. Senate bid last year as a longshot, promising to run a "vicious" and "ruthless" crusade against Democratic incumbent Tim Kaine in a style similar to President Donald Trump. With just days to go until Election Day, there's little sign those Trump-like tactics — including personal attacks on Kaine and his son — have found purchase in increasingly blue Virginia. RICHMOND, Va. (AP) — U.S. Sen. Tim Kaine of Virginia and GOP challenger Corey Stewart traded accusations of hypocrisy and bad faith Tuesday in a campaign debate heavily focused on sexual misconduct allegations against Supreme Court nominee Brett Kavanaugh and some members of Congress. U.S. Sen. Tim Kaine and GOP challenger Corey Stewart traded insults in a testy debate Wednesday over whose style would best represent Virginia in the U.S. Senate. Kaine, a folksy former governor who was once dubbed "America's Dad" when he was Hillary Clinton's running mate in 2016, said Virginians want a forward-looking leader who doesn't stoke divisions for political gain like he said Stewart does. HOT SPRINGS, Va. (AP) — The candidates in Virginia's U.S. Senate race had a quarrelsome first debate Saturday with President Donald Trump serving as a frequent focal point of the sparring. RICHMOND, Va. (AP) — Some GOP congressmen in Virginia want nothing to do with their own party's provocative candidate for Senate, Corey Stewart, an outspoken acolyte of President Donald Trump and defender of Confederate monuments. Stewart says he's fine with the cold shoulders if it helps Republicans win. By contrast, Democrats appear to be one big happy family, with down-ballot Democrats eager to campaign with incumbent Tim Kaine. RICHMOND, Va. (AP) — Democratic U.S. Sen. Tim Kaine and Republican challenger Corey Stewart have accepted invitations to participate in Virginia's oldest and most widely broadcast televised debate this fall. "The People's Debate" will be held on Oct. 2 in the studio of WCVE-TV — Virginia Public Television — in collaboration with WTVR-CBS6. The media partners will distribute the debate to broadcasters statewide so the forum will be available to voters across Virginia. RICHMOND, Va. (AP) — A tea party group backed by billionaire conservatives plans to sit out the U.S. Senate race in Virginia. News outlets report that Americans for Prosperity has announced it won't support Republican nominee Corey Stewart as he tries to unseat incumbent Democratic Sen. Tim Kaine. RICHMOND, Va. (AP) — The three Virginia Republicans looking to unseat Democratic Sen. Tim Kaine are all relative political newcomers with limited financial backing. Corey Stewart, Nick Freitas and E.W. Jackson are vying for the GOP Senate nomination in what's expected to be a difficult year for Republicans. Several higher profile Republicans who had earlier suggested they might run took a pass. LYNCHBURG, Va. (AP) — Virginia Republicans hoping to upset Hillary Clinton's former running mate in a U.S. Senate race heaped praise on President Donald Trump at a debate Thursday while arguing over who would be more loyal to the president if elected. Trump was a central focus of the hour-long debate, which pitted a polished young up-and-comer who has the backing of the establishment wing of the state party against an ultra-Trump supporter whose bomb-throwing style mirrors the president's. Republican U.S. Senate hopeful Corey Stewart on Thursday said that not only would he have voted against last month's $1.3 trillion spending bill he would have called for the resignation of Senate Majority Leader Mitch McConnell over what he called "Chuck Schumer's bill." "It was Chuck Schumer's bill, and was put there by Republicans," Mr. Stewart, one of three candidates seeking the GOP nomination for U.S. Senate in Virginia, said at a Republican debate at Liberty University in Lynchburg, Va.
RICHMOND, Va. (AP) — Two contenders for the Republican U.S. Senate nomination in Virginia clashed Saturday in the first debate of the primary race. Corey Stewart, a candidate for governor last year, and state Del. Nick Freitas of Culpeper squared off in a debate before the Virginia Tea Party in Richmond. Virginia GOP Senate candidate Corey Stewart called on the Republican speaker of the House of Delegates in Richmond to resign after the GOP signed off on a plan to expand Medicaid under Obamacare. Republicans in the Old Dominion had long opposed Medicaid expansion, but switched gears after losing 16 seats in the House of Delegates in the 2017 election and seeing their majority in the lower chamber shrink to a single seat. RICHMOND, Va. (AP) — A conservative minister announced he's joining the fight for the Republican nomination to challenge Democratic U.S. Sen. Tim Kaine in 2018. E.W. Jackson announced his campaign Monday on The John Fredericks Show radio program. The lawyer-turned-preacher ran unsuccessfully for lieutenant governor in 2013. He joins Corey Stewart, a former state campaign chairman of President Donald Trump, and Del. Nick Freitas, as announced candidates. HOT SPRINGS, Va. (AP) — Virginia Del. Nick Freitas has announced his plan to seek the Republican nomination to challenge Democratic U.S. Sen. Tim Kaine in 2018. Freitas will go up against Corey Stewart — the chairman of the Prince William Board of County Supervisors — for the nomination. Stewart, who has modeled himself after President Donald Trump, ran a primary campaign for governor this year, but narrowly lost the Republican nomination to Ed Gillespie. VIRGINIA BEACH, Va. (AP) — Corey Stewart, the outspoken supporter of President Donald Trump who narrowly lost a bid to be Virginia's GOP candidate for governor, is rallying voters for the Republican ticket. Stewart spoke Sunday at a "Bikers for Trump" event in Virginia Beach, where he urged the crowd to "take back Virginia." RICHMOND, Va. (AP) — Former Republican presidential hopeful Carly Fiorina says she won't run for a U.S. Senate seat in Virginia next year. Fiorina announced her decision in media outlets Friday, saying she was not ruling out a future run for office. The former Hewlett-Packard chief executive ran unsuccessfully for president last year and lost a 2010 Senate bid in California. NEW YORK (AP) — The statue of Robert E. Lee in Charlottesville, Virginia, was the focus of an emotional debate in the state's Republican primary election weeks before it became a flashpoint in the nation's struggle over race. RICHMOND, Va. (AP) — An outspoken supporter of President Donald Trump who narrowly lost a bid to be Virginia's GOP candidate for governor is now running for the U.S. Senate. Corey Stewart announced his Senate candidacy Thursday, saying he is the type of Republican "fighter" needed to unseat Sen. Tim Kaine in next year's election. CHARLOTTESVILLE, Va. (AP) — A statue of Confederate Gen. Robert E. Lee has been vandalized in Charlottesville. The Daily Progress reported Saturday (http://bit.ly/2sBr0Jc ) that red paint was splashed on the base of the statue in Emancipation Park, which had been known as Lee Park until the city council changed the name last month. Black graffiti was sprayed on the statue overnight Friday as well. RICHMOND, Va. (AP) — Virginia Democrats are promising party unity after a hotly contested primary battle for governor. The Richmond Times-Dispatch reports (http://bit.ly/2tABmcm) that Lt. Gov. Ralph Northam and former U.S. Rep. Tom Perriello urged Democrats to work together in this year's general election. Their comments came Saturday evening at the party's annual Jefferson-Jackson fundraising dinner. RICHMOND, Va. (AP) — Ed Gillespie's shocking near-defeat in the Virginia GOP primary for governor Tuesday highlights a hard truth for centrist Republicans in the age of President Donald Trump: keep too much of a distance from the president and his supporters will make you pay. Virginia Republican Corey Stewart says he may run for U.S. Senate next year after his surprisingly strong showing in the GOP primary for governor. RICHMOND, Va. (AP) — Virginia Lt. Gov. Ralph Northam won the Democratic nomination in the closely watched race for governor Tuesday, defeating a more liberal insurgent challenger in a contest to be one of the party's standard-bearers against President Donald Trump. Republican Ed Gillespie has narrowly won his party's nomination in Virginia's race for governor, eking out a victory against an ardent supporter of President Donald Trump. Gillespie is a former Republican National Committee Chairman who had a huge fundraising advantage and enjoyed the solid backing of most state elected Republicans, but largely kept Trump at arm's length during the campaign. GOOCHLAND, Va. (AP) — The front-runner for the Republican nomination in Virginia's closely watched race for governor expressed lukewarm support for President Donald Trump at a GOP debate Saturday in Goochland. Three Republicans vying to be Virginia's next governor — a closely watched contest that could provide an early window on President Donald Trump's popularity — showed their markedly different styles in a debate Thursday. Frontrunner Ed Gillespie, a moderate GOP insider who advised former President George W. Bush, largely ignored attacks against him in the debate ahead of a June primary, instead focusing on pocketbook issues such as lowering taxes. RICHMOND, Va. (AP) — Former President George W. Bush is set to be a special guest at a fundraiser for Virginia Republican gubernatorial hopeful Ed Gillespie. The Roanoke Times reports (http://bit.ly/2oam1h1 ) that wealthy businessmen will host Gillespie at a Dallas fundraiser Wednesday, with Bush as a guest. Gillespie was White House counselor under Bush, who donated $25,000 to Gillespie's political action committee last year. FAIRFAX, Va. (AP) — Former Republican National Committee Chairman Ed Gillespie has won a straw poll in Fairfax County in the race for the GOP nomination for Virginia governor. RICHMOND, Va. (AP) — An altered Facebook headline on a newspaper story involving a statue of Robert E. Lee has blown up into a major sore point in the Virginia GOP primary for governor — another instance of politicians or their allies changing headlines to suit their own purposes on that platform. 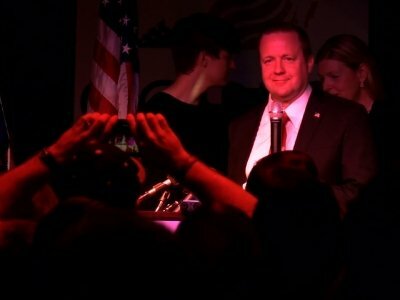 RICHMOND, Va. (AP) — Dozens of protesters with banners, bullhorns and drums chanted and shouted at Republican gubernatorial hopeful Corey Stewart during a campaign event in Richmond. Stewart held a rally Saturday afternoon where he railed against sanctuary cities that don't cooperate with federal immigration authorities.